No one knows what the future is for Vince Carter. In the past few years, it feels as if Carter is playing it one season at a time. He’s currently playing out his 21st season with the Atlanta Hawks. Unlike Dwyane Wade and Kobe Bryant before him, Carter never announced whether this will be his final season. 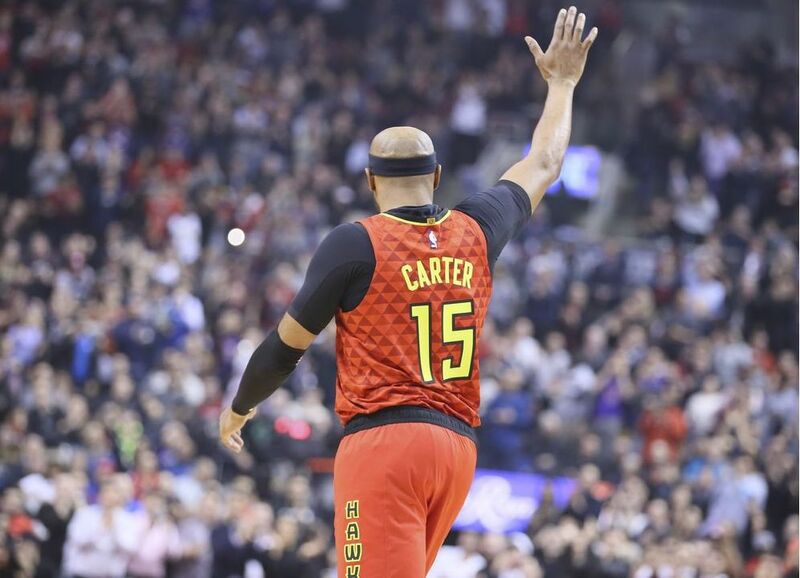 With Atlanta making their last visit to Toronto for the season, this could very well be the last time Carter visits the 6ix. So, Toronto fans made sure they showed a lot of love to the superstar that put their franchise on the map. Carter hit a three-pointer in his very first possession of the game, giving fans a glimpse of the player they used to cheer for. He finished with six points. This was one of those games where everyone wins. The Hawks stuck to the Raptors for most of the game, puttting into play a game-winner from Carter. In the end though, the Raptors’ new superstar sealed the win. Kawhi Leonard got his sixth steal of the game to lead to a Serge Ibaka bucket, sealing the win. Leonard had 31 points, six assists and six steals to lead the Raptors to another win. It might not have ended the way he wanted but Toronto made sure that Carter felt the love from a city he once called home. There were two notable 40-point games in the league today. Andrew Wiggins dropped 40 points to go along with 10 rebounds and four assists to lead the Timberwolves to a win over the Thunder. This performance by Wiggins is what everyone envisioned from him when he was drafted as the top pick back in 2014. He was supposed to be a Kobe-esque midrange killer. So far he hasn’t panned out to be just that. But playing away from the shadow of Jimmy Butler has allowed him to come out of his shell this season. This win also marks their first win under new head coach Ryan Saunders. Ryan Saunders, the son of late former Timberwolves coach Flip Saunders, got his first win tonight. The other 40-point game was care of Klay Thompson who dropped 43 against the Knicks. For most of this season, Thompson has struggled. His shooting has been off and no one really knows why. At one point, Thompson even thanked his shooting hand after making several threes in one game. This is his biggest game since he dropped 52 back in October. Warriors fans are hoping they get more of THIS Thompson the rest of the way. With less than 10 seconds left in a tied game, the Nuggets went to their superstar Nikola Jokic for the win. He set the pick and rolled to the basket where he got the pass from 12-feet out. Jokic was blanketed by the defense so his had to flip it high up over the outstretched arms of the defense. The high-looping floater dropped and the Nuggets escaped with the win. Afterwards, Jokic continued winning with a killer post-game quote.